The couch in my living room was literally threadbare and bursting at the seams so I knew we had to replace it. 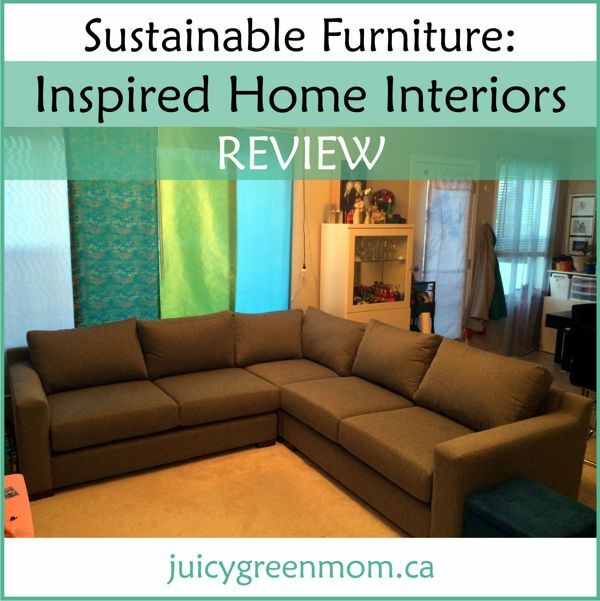 The furniture world can be very daunting for a green-minded mom, however, as toxic chemicals can be present in virtually every part of a couch – the foam, the glues, the fabric, the springs, the frame. Many of the same problems with looking for a bed apply to couches. If you live in the US, California has a few great sustainable options because it is the state with the most stringent regulations regarding flame retardants. In Canada, it was really hard to find something that wasn’t going to break the bank. I was thrilled when I found the company G Romano based out of Quebec – and even more thrilled that a local store in Edmonton carried their furniture: Inspired Home Interiors. G Romano‘s hardwood and plywood are from responsibly managed forests in North America, and they use soy-based foam with no flame retardants. They also use water-based adhesives and stains, 60% recycled steel springs, and eco-friendly fabrics. They have just started making prototypes for their Verde line which will have natural latex foam (which for me would look like the best option) – however it was waaay out of our price point. We decided to go with the Dublin sectional in an Oxford fabric (made from 60% Recycled Cotton, 20% Poly, 19% Acrylic, 1% Nylon) with soy foam (feather seats and back were an optional upgrade). Inspired Home Interiors will be opening a new showroom at The Shops At Boudreau in St. Albert in August 2015. Environmental Working Group (EWG) has a great article about couches that don’t have fire retardants as of 2015. Where have you found sustainable furniture?